Comics Legends.A founding father of the world's most popular artform, Frederick Opper was born in Madison, Ohio in 1857. When he was fourteen, Opper was drawing cartoons for the Madison Gazette newspaper; at twenty, he was a staff artist for Wild Oats magazine and was selling political cartoons to Puck and Harper's Bazaar. Opper's most famous creation, the comic strip Happy Hooligan, began syndication in the Sunday comic sections of the New York and San Francisco Hearst newspapers in 1900. Happy Hooligan was an Irish tramp. 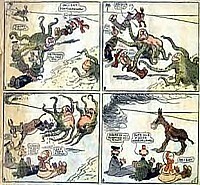 Frederick Opper also created the comic strips Maud the Mule (1904), Alphonse and Gaston (1902), Our Antedeluvian Ancestors, How son Lots (one of the earliest satires on suburban life in America). He also worked as political cartoonist at the New York American and Journal newspaper. All of Opper's work is 'bigfoot', abstract and minimalistic in style. Heavily steeped in the styles and events of his time, and certainly "politically incorrect" in ours because of ethnic stereotyping, his work remains entertaining and offers a visually valuable historical look into the early 1900s. Poor eyesight forced Opper to discontinue working in 1932, and he died in 1937. Among his published works are: Happy Hooligan: a complete compilation, 1904-1905 (Hyperion Press, 1977); Happy Hooligan (pgs. 49 & 62 in The Comic Strip Century, Kitchen Sink Press, 1995, several weekly episodes); "Happy Hooligan's Honey-moon" (copyright 1917 and reproduced on p. 33 of Golf in the Comic Strips, General Publishing Group, 1997); The Smithsonian Collection of Newspaper Comics, pgs. 9 & 159). Happy was merchandised in toys, games, mugs and pinbacks. Frederick Opper's work is recommended for its historic importance and well as for his creation of comics techniques used even today. Find Opper's Happy Hooligan and more at storefront and on-line comics shops, possibly at your local library, and at on-line auctions.